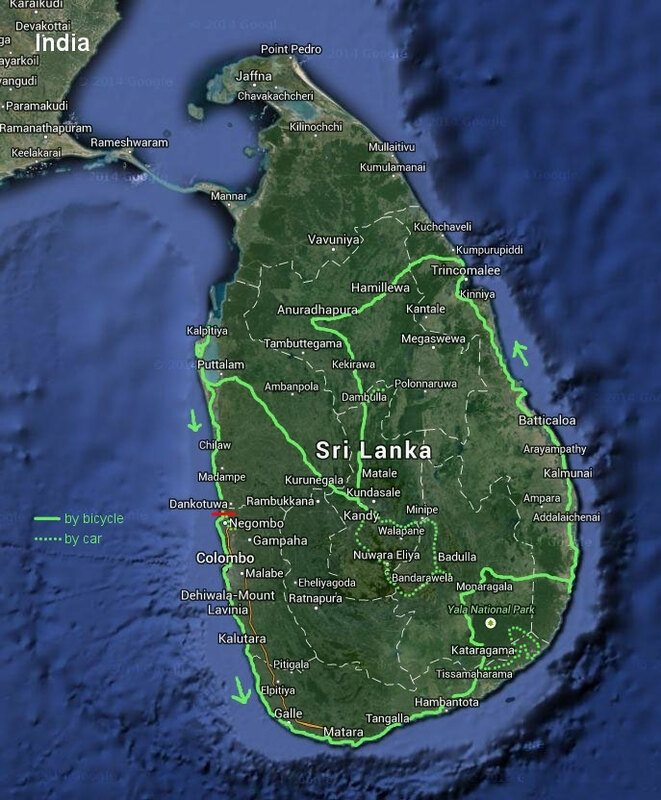 1,326 km bicycle trip almost around entire Sri Lanka Island along the west, south and east coast, across the island´s Highlands and back to the west coast. Do you like Cycling Sri Lanka? After a free upgrade to business class from Dubai to Colombo, we arrived relaxed in Sri Lanka! With a taxi we drove to the previously booked guesthouse in Negombo north of the capital Colombo. So we could unpack everything in peace and get the wheels out of the boxes. The next morning we went directly to Colombo, a bit stressful by the traffic of the capital to the south. As soon as we left the suburbs of Colombo, it was a little quieter and we cycled along the coast to Panadura and the next day to the nearby and beautiful Bentota, where we spent the rest of the day on the beach. The development decreased more and more and the traffic became much calmer the farther we moved to the south. In the picturesque Hikkaduwa we lived right on the beach under palm trees with great views of the sea. Arrived in the south of Sri Lanka, we really wanted to observe whales in Mirissa, but decided in the harbor but then around. It started to rain quite easily, the first few drops since our arrival, when it had rained neatly on landing, but since then no more. We did not know yet that these few drops would be the last ones we would experience on this trip! We drove on to Tissa in the southeast of the island. In Tissamaharama, Tissa for short, we booked a half day safari through Yala National Park. At 5.00 clock in the morning it started, but even before we reached the National Park ever remained our SUV with engine breakdown. Fortunately, with a replacement car, we went further into the park! We saw elephants, the local lip bear and countless other animals! Unfortunately, we did not meet one of the rare leopards, but that was better for the leopards! In the afternoon we went by bus to Kataragama, which was certainly worth seeing during the annual local festival, but without the festival was not really worth the detour. The next morning we started inland, as a drive along the coast was not possible due to lack of road and because of the leopard. Hot it went through the western edge of the Yala National Park and then to the east coast to Arugam Bay, the wave Mecca of the island. Compared to spots in other parts of the world, the waves here were rather small, but the place was beautiful and there were many wooden cabins and cabanas to stay right on the beach under the palm trees and with the sound of the sea to fall asleep! We relaxed on the beach, walked a bit along the sea and took a tuk-tuk to the Potuvil Lagoon, where we took a boat and a guide through the mangroves. After a lot of rest, we continued along the very lonely coast north to Batticaloa. There were no noteworthy places or even accommodations on the way, completely different than on the west and the south coast! Until a few years ago, the roads had not even been passable, as many bridges were destroyed by the 2004 war and tsunami. But now all the bridges were repaired, but it would probably be a while before the tourism would slowly discover the deserted, endless beaches of this coast. We cycled further north to Kalkuda Bay and Pasekudah Bay, where there was again tourism and therefore also accommodations. In postcard-perfect turquoise waters on white beaches, we ate ourselves in the sea, enjoyed a few cold drinks in the beach bars before heading north. Against strong headwind we fought our way to Uppuveli, where we again lived right on the beach, enjoyed the palm trees and the sea and made a snorkeling trip to Pigeon Island. There we snorkeled with sharks, puffer fish and many other marine life, before going back to Uppuveli by boat. We rested on the beach for the rest of the day before heading home the next day. We cycled west to the famous Anuradhapura and the next day explored by bike the countless temples and ancient sites, the Abhayagiri Monastery, the Citadel, Jetavanarama, Ruvanvelisaya Dagoba, Mahavihara, the Thuparama Dagoba, the Mirisavatiya Dagoba, the Royal Pleasure Gardens and Kurumuniya Vihara and Vessagiriya. The next day we went through the middle of the island south to Dambulla, where we first hired a tuk-tuk to drive us to Sigiriya, the huge monolith, on which was an ancient fortification and we adventurous in the rocks hewn steps and paths on the vertical rock wall climbed. Upstairs you had a great view over the surrounding inland. Back in Dambulla we visited the famous cave temples and the local wholesale market. The next day we cycled up to Kandy at over 500 m altitude. Because of the world-famous annual festival, almost all accommodations were booked out, so we had to move in far outside the city. For several days there had been festive processions throughout the city. With the tuk-tuk we drove to the final procession on the last day of the festival, the biggest parade of the whole week. You could buy all sorts of places for a fee: a seat on the street, a chair on the street, a window seat in a house, a place on the roofs. However, there was not much to choose from and half Sri Lanka seemed to be pushing its way through the streets and trying to reserve the best seats for the parade. After some back and forth, we decided on a place on the roof of a building, the higher, the cheaper were the places. The parade was great: endless groups of dancers and festively decorated elephants danced and marched through the city! Only at 2:00 o'clock at night we were back in the guesthouse! Due to time constraints, we decided not to go south by bike, but agreed with the owner of the guesthouse that he would pay us for a two-day trip to Horton Plains National Park and the southern mountains with his son. So we drove off in his car, past the Rambadi Falls to which we ran, and to a tea factory, through endless tea plantations to Newara Eliya at 1,900m, where it was noticeably colder! The next morning we were early at the entrance of the national park. We hiked to Mini World's End and World's End, two viewpoints with breathtaking views! Back it went by Hobbit-same landscape to the car. Via Haputale we drove to the Dowa Temple, through the Ella Gap to the Rawana Ella Waterfalls and to Badulla to the Muthiyagana Vihara Temple, before going back to Kandy. After 370 km we were back at the guesthouse. With much tailwind we cycled the next day 177 km northwest to Kalpitiya back to the west coast. After two days there we went south along the coast back to Negombo where after one night we took the transfer back to the airport. It had been a great time! Sri Lanka was perfect for cycling! Unfortunately we could not look at the north of the island due to time constraints. Who knows, maybe we would come back again!